Skinade* is all over social media right now and when I was offered a 30 day trial* I jumped at the chance. Skinade is a drink developed by UK scientists to help boost your body's natural production of collagen and hyaluronic acid. 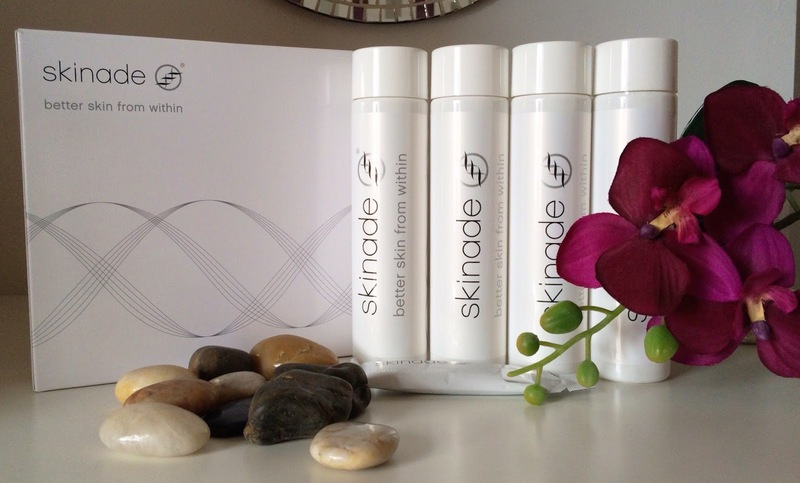 Skinade claims to help us achieve better skin from within by taking their liquid supplement on a daily basis. Collagen is a natural protein found in the skin and acts a bit like scaffolding for the face. Our production of collagen starts to decrease as we get older, some say it starts from around the age of 20-25, and as its decreases wrinkles, lines and sagging start to appear. Lots to look forward to hey ladies? 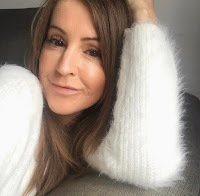 Lots of women, and I guess men too, want to steer clear of botox, fillers and face lifts, so is this were Skinade comes in to offer a helping hand? The supplement comes in a white, very contemporary style bottle and is so easy to take. No diluting, just drink straight from the bottle if you like, which is what I did when I took it to work. You're wondering what it tastes like? Well, it has a natural flavour of mangosteen and peach and is quite sweet, may be a bit too sweet and sickly for some but I liked it (I have a sweet tooth!). Don't worry though too much as you can add it to juices or smoothies to make it go down a bit easier if you really are not keen on the taste. It's lactose, gluten and dairy free. Skinade is manufactured and bottled in the UK, formulated with essential micro-nutrients and high grade hydrolysed marine collagen peptides amongst other amazing ingredients to help repair our skin. To consume the same amount of essential nutrients and collagen peptides by tablet form you would have to take around 20 tablets a day!!! I'm not good with tablets, and lets face it who'd want to take 20 a day? I'd rather have this small bottle of goodness that's easy to swallow. Also, apparently taking this kind of supplement in tablet form is harder to absorb and the liquid form has a much higher absorption rate, up to 90-95% absorption rate in fact. Some experts disagree with this theory though and as I'm no scientist I'll not get into that debate, I'll leave you to read the science bit on the Skinade website. They've even thought about when you're away on your hols and provided us with travel sachets so you don't have to lug the bottles around. Once again easy to use, you do have to dilute this one in water, which takes seconds, stir and drink! I'll start with the negative as I want to finish on a positive note. Skinade is expensive, but then something that has all these beauty benefits in a bottle isn't going to cost just pennies is it? I enjoyed drinking my sweet supplement every day, looked forward to it actually. As for my results, I can't say it made me look more youthful in the 30 days, I wish, BUT I did notice that my skin was a little plumper and more glowy shall we say. Without a doubt my skin looked softer, better, healthier, and that's saying something with my daily arthritis struggles! The thing is the 30 day trial does not give optimum results, they say it can take up to 90 days to really see the full benefits so it's hard for me to say how well Skinade does work. I definitely liked what I saw in the mirror with the short time I was taking it and only wish I could afford to continue to drink Skinade on a regular basis as I'm sure I would have seen even better results. If you would like to read more or place an order you'll find the official website here along with all the facts and figures you need! Do you take any skincare supplements already? Do you like the sound of a supplement in liquid form? Don't forget to follow along on Bloglovin to keep up to date! I used to take omega-3's in order to keep my hair healthy, but after I finished the last bottle I haven't bothered to get another. This stuff looks pretty interesting, however I don't think I've got the cash to shell out and try it! Lovely review though, thank you! Thanks for the lovely comment, and for taking the time to read my post. Omega 3 sounds a good option though!